So far so good we've got so many Top Djs out there And they all started from somewhere just like this Young VICTOR BABATUNDE OYIDI popularly known as DJ VOYST working out his way to the industry by merging so many songs and finally coming out with his mixtape for the first half of this year, JAM IT !!! 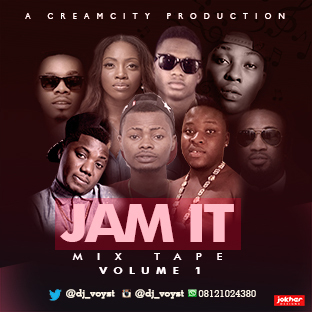 JAM IT has so many top artist in it like Olamide, Wizkid, Davido Patoranking, Cdq, Sarkodie, Ola dips, Skylolo, Praiz, Lil Kesh, Phyno, Mr 2kay, Victoria Kimani, Tiwa Savage and so on!!! Download it and get d groove on!! !